Complete mass of NWA 4932. History: Purchased by Greg Hupé from a Moroccan dealer in Tagounite, Morocco, in October 2007. Physical characteristics: A single, light colored 93.3 g stone. 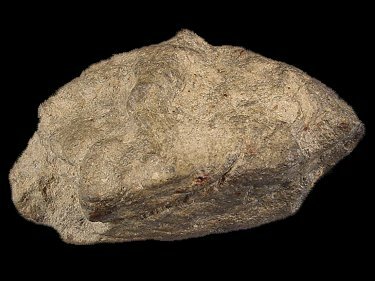 The interior is light gray, mostly very fine grained with a few white clasts (Fig. 2), and prominent but sparsely distributed metal grains (surrounded by hydroxide staining). 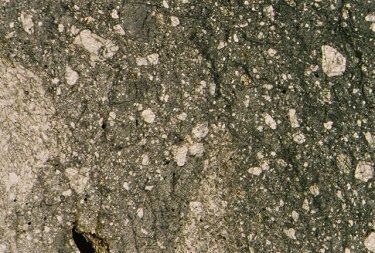 Petrography: (A. Irving and S. Kuehner, UWS) Breccia composed of small gabbroic to troctolitic clasts (granular aggregates of rounded olivine grains and calcic plagioclase enclosed within low-Ca pyroxene with accessory Ti-chromite and troilite), sparse large grains of kamacite (up to 1 mm, partly altered to iron hydroxide) and rare large grains of silica polymorph in a dominant, very fine grained matrix of the same phases. 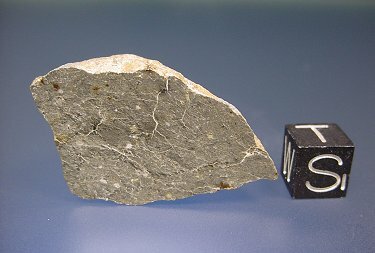 There are secondary (terrestrial) veinlets and small patches of calcite. 24.5 gram main mass of NWA 4932. Thin Section image in Plane Polarized Light (image measures 7mm wide).